This entry was posted in news on September 15, 2011 by James Day. MINI USA has released the MINI Ordering and Pricing Guide for model year 2012 for every model in the MINI family. The guides contain model codes; engine codes; base prices; option codes; and standard and optional features descriptions, availability, and prices. The option packages are shown with their individual options. 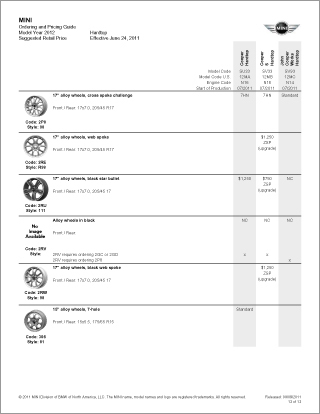 The final section has wheel options with images (see image, right). 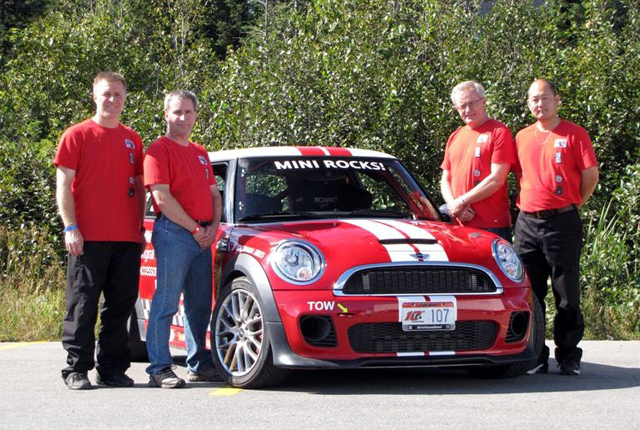 This entry was posted in news and tagged motorsport Targa Newfoundland on September 15, 2011 by James Day. And when it comes to Targa Newfoundland 2011, our story is over. Despite heroic efforts on the part of our crew, we just couldn’t solve the electronic gremlins that afflicted our little car. Fellow competitor Andrew Comrie-Picard commented that this was the first time our team had ever had a ‘mechanical’ at Targa. He’s right – in nine events, with three different MINIs, they’ve always been as reliable as a brick through a plate glass window. Sure, we had a couple of flat tires in Year Two (2003), and I threw the car into the woods at 160 km/h in Year Seven (2008). But neither of them was the car’s fault. The worst issue we ever had was one year – maybe Year Three, 2004? – when our tire pressure warning system was giving us ‘false negatives’ – saying we had low tire pressure when in fact we didn’t. The Check Engine Light and intermittent non-starting issues this year presumably were symptoms of a deeper problem. And when the electronics decided we were ‘tampering’ with the system, it turned on the security lock-out function, and we couldn’t even do any further diagnostics on it. At least, that’s the best explanation for which I have the technical competence to deliver. I’m sure when the car returns home and a full examination is done we’ll discover the problem. But in a parking lot in Gander Newfoundland in the rain at 3 a..m. – well, there’s only so much you can do. Much thanks from me (second from the right) to our crew – from left to right, Alain Lauziere, Crew Chief; Brian Bourbonniere, co-driver; Kevin Abe, support/technician. We’re off now to watch the Gander town stage which is always a hoot – to drive anyway. The MINI always looked good through there, or so people always told me. It’ll be bittersweet to watch others do it. I’ll be flying home tomorrow, so this will be my last on-site blog posting, although I will be returning Saturday for the Gala Awards Banquet. The rally runs until September 17th and there are still a couple MINIs running in the Modern class. You can follow each day’s results on the Targa Newfoundland Results webpage.